For the documentary film, see Albert Schweitzer (film). He received the 1952 Nobel Peace Prize for his philosophy of "Reverence for Life", becoming the eighth Frenchman to be awarded that prize. His philosophy was expressed in many ways, but most famously in founding and sustaining the Albert Schweitzer Hospital in Lambaréné, in the part of French Equatorial Africa which is now Gabon. As a music scholar and organist, he studied the music of German composer Johann Sebastian Bach and influenced the Organ Reform Movement (Orgelbewegung). Schweitzer was born in the province of Alsace, which was a part of the Holy Roman Empire up to the Thirty Year War. In 1648, with the Treaty of Westphalia, the Habsburgs renounced their claims to its territory, when it became a part of France for the first time. In 1871, through the Treaty of Frankfurt, Alsace became a part of the German Empire ("Reichsland"), becoming French a second time in 1919, after Germany's defeat during the First World War. Schweitzer considered himself French,[additional citation(s) needed] but wrote mostly in German. His mother-tongue was Alsatian, a Low Alemannic German dialect, although he was also fluent in French and High-German. Schweitzer was born in Kaysersberg, Haute Alsace, the son of Louis Schweitzer and Adèle Schillinger. He spent his childhood in the Alsatian village of Gunsbach, where his father, the local Lutheran-Evangelical pastor of the EPCAAL, taught him how to play music. The tiny village became home to the Association Internationale Albert Schweitzer (AIAS). The medieval parish church of Gunsbach was shared by the Protestant and Catholic congregations, which held their prayers in different areas at different times on Sundays. This compromise arose after the Protestant Reformation and the Thirty Years' War. Schweitzer, the pastor's son, grew up in this exceptional environment of religious tolerance, and developed the belief that true Christianity should always work towards a unity of faith and purpose. Schweitzer's first language was the Alsatian dialect of German language. At the Mulhouse gymnasium he received his "Abitur" (the certificate at the end of secondary education) in 1893. He studied organ in Mulhouse from 1885 to 1893 with Eugène Munch, organist at the Protestant cathedral, who inspired Schweitzer with his profound enthusiasm for the music of German composer Richard Wagner. In 1893 he played for the French organist Charles-Marie Widor (at Saint-Sulpice, Paris), for whom Johann Sebastian Bach's organ music contained a mystic sense of the eternal. Widor, deeply impressed, agreed to teach Schweitzer without fee, and a great and influential friendship thus began. From 1893 Schweitzer studied Protestant theology at the Kaiser Wilhelm University in Strasbourg. There he also received instruction in piano and counterpoint from professor Gustav Jacobsthal, and associated closely with Ernest Munch, the brother of his former teacher, organist of St William church, who was also a passionate admirer of J.S. Bach's music. Schweitzer served his one-year compulsory military service in 1894. Schweitzer saw many operas of Richard Wagner in Strasbourg (under Otto Lohse) and in 1896 he managed to afford a visit to the Bayreuth Festival to see Wagner's Der Ring des Nibelungen and Parsifal, which deeply impressed him. In 1898 he went back to Paris to write a PhD dissertation on The Religious Philosophy of Kant at the Sorbonne, and to study in earnest with Widor. Here he often met with the elderly Aristide Cavaillé-Coll. He also studied piano at that time with Marie Jaëll. In 1899, Schweitzer spent the summer semester at the University of Berlin and eventually obtained his theology degree in University of Strasbourg. He published his PhD thesis at the University of Tübingen in 1899. In 1905, Schweitzer began his study of medicine at the University of Strasbourg, culminating in the degree of M.D. in 1913. Schweitzer rapidly gained prominence as a musical scholar and organist, dedicated also to the rescue, restoration and study of historic pipe organs. With theological insight, he interpreted the use of pictorial and symbolical representation in J. S. Bach's religious music. In 1899 he astonished Widor by explaining figures and motifs in Bach's Chorale Preludes as painter-like tonal and rhythmic imagery illustrating themes from the words of the hymns on which they were based. They were works of devotional contemplation in which the musical design corresponded to literary ideas, conceived visually. Widor had not grown up with knowledge of the old Lutheran hymns. The exposition of these ideas, encouraged by Widor and Munch, became Schweitzer's last task, and appeared in the masterly study J. S. Bach: Le Musicien-Poète, written in French and published in 1905. There was great demand for a German edition, but, instead of translating it, he decided to rewrite it. The result was two volumes (J. S. Bach), which were published in 1908 and translated into English by Ernest Newman in 1911. Ernst Cassirer, a contemporaneous German philosopher, called it "one of the best interpretations" of Bach. During its preparation Schweitzer became a friend of Cosima Wagner, then resident in Strasbourg, with whom he had many theological and musical conversations, exploring his view of Bach's descriptive music, and playing the major Chorale Preludes for her at the Temple Neuf. Schweitzer's interpretative approach greatly influenced the modern understanding of Bach's music. He became a welcome guest at the Wagners' home, Wahnfried. He also corresponded with composer Clara Faisst, who became a good friend. His pamphlet "The Art of Organ Building and Organ Playing in Germany and France" (1906, republished with an appendix on the state of the organ-building industry in 1927) effectively launched the 20th-century Orgelbewegung, which turned away from romantic extremes and rediscovered baroque principles—although this sweeping reform movement in organ building eventually went further than Schweitzer had intended. In 1909 he addressed the Third Congress of the International Society of Music at Vienna on the subject. Having circulated a questionnaire among players and organ-builders in several European countries, he produced a very considered report. This provided the basis for the International Regulations for Organ Building. He envisaged instruments in which the French late-romantic full-organ sound should work integrally with the English and German romantic reed pipes, and with the classical Alsace Silbermann organ resources and baroque flue pipes, all in registers regulated (by stops) to access distinct voices in fugue or counterpoint capable of combination without loss of distinctness: different voices singing the same music together. In 1905 Widor and Schweitzer were among the six musicians who founded the Paris Bach Society, a choir dedicated to performing J.S. Bach's music, for whose concerts Schweitzer took the organ part regularly until 1913. He was also appointed organist for the Bach Concerts of the Orféo Català at Barcelona, Spain, and often travelled there for that purpose. He and Widor collaborated on a new edition of Bach's organ works, with detailed analysis of each work in three languages (English, French, German). Schweitzer, who insisted that the score should show Bach's notation with no additional markings, wrote the commentaries for the Preludes and Fugues, and Widor those for the Sonatas and Concertos: six volumes were published in 1912–14. Three more, to contain the Chorale Preludes with Schweitzer's analyses, were to be worked on in Africa, but these were never completed, perhaps because for him they were inseparable from his evolving theological thought. On departure for Lambaréné in 1913 he was presented with a pedal piano, a piano with pedal attachments to operate like an organ pedal-keyboard. Built especially for the tropics, it was delivered by river in a huge dug-out canoe to Lambaréné, packed in a zinc-lined case. At first he regarded his new life as a renunciation of his art, and fell out of practice: but after some time he resolved to study and learn by heart the works of Bach, Mendelssohn, Widor, César Franck, and Max Reger systematically. It became his custom to play during the lunch hour and on Sunday afternoons. Schweitzer's pedal piano was still in use at Lambaréné in 1946. According to a visitor, Dr. Gaine Cannon, of Balsam Grove, N.C., the old, dilapidated piano-organ was still being played by Dr. Schweitzer in 1962, and stories told that "his fingers were still lively" on the old instrument at 88 years of age. Sir Donald Tovey dedicated his conjectural completion of Bach's The Art of Fugue to Schweitzer. Schweitzer's recordings of organ-music, and his innovative recording technique, are described below. In 1906 he published Geschichte der Leben-Jesu-Forschung ("History of Life-of-Jesus research"). This book, which established his reputation, was first published in English in 1910 as The Quest of the Historical Jesus. Under this title the book became famous in the English-speaking world. A second German edition was published in 1913, containing theologically significant revisions and expansions: but this revised edition did not appear in English until 2001. In 1931 he published Mystik des Apostels Paulus ("The Mysticism of Paul the Apostle"); a second edition was published in 1953. In The Quest, Schweitzer reviewed all former work on the "historical Jesus" back to the late 18th century. He showed that the image of Jesus had changed with the times and outlooks of the various authors and gave his own synopsis and interpretation of the previous century's findings. He maintained that the life of Jesus must be interpreted in the light of Jesus' own convictions, which reflected late Jewish eschatology and apocalypticism. Schweitzer writes: The Jesus of Nazareth who came forward publicly as the Messiah, who preached the ethic of the kingdom of God, who founded the kingdom of heaven upon earth and died to give his work its final consecration never existed. He is a figure designed by rationalism, endowed with life by liberalism, and clothed by modern theology in a historical garb. This image has not been destroyed from outside; it has fallen to pieces... He observes the many verses describing important events that never took place and technically, now, never can take place. The concept that Christianity started as a Jewish apocalyptic movement is evidenced by the teachings of the historical Jesus concerning the end of days. Not only did he preach he would rise from the grave, but that he would also ascend to heaven and one day return to judge and rule over the world, saying that no one, including himself, knew the exact time of his return, but it would be before the end of the end of the first generation of followers. In The Quest of the Historical Jesus, Schweitzer verifies and cross-referenced the many New Testament verses declaring imminent fulfillment of the promise of the World's ending within the lifetime of Jesus's original followers. He noted that in the gospel of Mark, Jesus speaks of a "tribulation", with his "coming in the clouds with great power and glory" (St. Mark), and states when it will happen: "This generation shall not pass, till all these things be fulfilled" (St. Matthew, 24:34) or, "have taken place" (Luke 21:32). Similarly, in 1st Peter 1:20, "Christ, who verily was foreordained before the foundation of the world but was manifest in these last times for you," as well as "But the end of all things is at hand," (1 Peter 4:7) and "Surely, I come quickly." (Revelation 22:20). Schweitzer observes that Jesus very specifically states "not seal up the words of the prophecy" and promises that some of his listeners, as well as the high priest at his trial, would be alive to see him return to the Earth. He says, "Blessed is he who reads and those who hear the words of the prophecy and heed the things which are written in it; for the time is near" (Revelation 1:3). St. Paul spoke of the last times, "Brethren, the time is short, it remaineth, that both they that have wives be as though they had none," (1 Corinthians 7:29) and "God hath in these last days spoken unto us by his Son," (Hebrews 1:2). Also, "There be some standing here which shall not taste of death till they see the Son of man coming in his kingdom" (Matthew 16:28) as well as "until they see that the kingdom of God has come with power," (Mark 9:1) and "till they see the kingdom of God" (Luke 9:27) reinforce this prophecy. Schweitzer observes that St. Paul, urgently, believed in the immediacy of the Second Coming of Jesus. Schweitzer insists that it is unreasonable for modern followers of Jesus to believe that "coming quickly", "near", and "soon" could mean hundreds, much less thousands, of years of the faithful waiting for a second coming. His evidence is verses "Blessed is he who reads and those who hear the words of the prophecy and heed the things which are written in it; for the time is near." (Revelation 1:3) "And he said to me, 'These words are faithful and true'; and the Lord, the God of the spirits of the prophets, sent His angel to show to His bond-servants the things which must soon take place." as well as "And behold, I am coming quickly. Blessed is he who heeds the words of the prophecy of this book." He references "And he said to me, "Do not seal up the words of the prophecy of this book, for the time is near" (Revelation 22:6, 7, 10, 12). "All these things shall come upon this generation" (Matthew 23:36) as well. Schweitzer's observations are in stark contrast to many modern variants of Christian belief, those ignoring these verses. Schweitzer concludes that 1st-century Christian theology; first belief, originating in the lifetimes of the very first followers of Jesus, is totally incompatible with modern theology. In The Mysticism of Paul the Apostle, Schweitzer first distinguishes between two categories of mysticism: primitive and developed. Primitive mysticism "has not yet risen to a conception of the universal, and is still confined to naive views of earthly and super-earthly, temporal and eternal." Additionally, he argues that this view of a "union with the divinity, brought about by efficacious ceremonies, is found even in quite primitive religions." On the other hand, a more developed form of mysticism can be found in the Greek mystery-cults that were popular in first-century A.D. society. These included the cults of Attis, Osiris, and Mithras. A developed form of mysticism is attained when the "conception of the universal is reached and a man reflects upon his relation to the totality of being and to Being in itself." Schweitzer claims that this form of mysticism is more intellectual and can be found "among the Brahmans and in the Buddha, in Platonism, in Stoicism, in Spinoza, Schopenhauer, and Hegel." Next, Schweitzer poses the question: "Of what precise kind then is the mysticism of Paul?" He locates Paul between the two extremes of primitive mysticism and developed mysticism. Paul stands high above primitive mysticism, due to his intellectual writings, but never speaks of being one with God or being in God. Instead, he conceives of sonship to God as "mediated and effected by means of the mystical union with Christ." He summarizes Pauline mysticism as "being in Christ" rather than "being in God." Paul's imminent eschatology (from his background in Jewish eschatology) causes him to believe that the kingdom of God has not yet come and that Christians are now living in the time of Christ. Christ-mysticism holds the field until God-mysticism becomes possible, which is in the near future. Therefore, Schweitzer argues that Paul is the only theologian who does not claim that Christians can have an experience of "being-in-God." Rather, Paul uses the phrase "being-in-Christ" to illustrate how Jesus is a mediator between the Christian community and God. Additionally, Schweitzer explains how the experience of "being-in-Christ" is not a "static partaking in the spiritual being of Christ, but as the real co-experiencing of His dying and rising again." The "realistic" partaking in the mystery of Jesus is only possible within the solidarity of the Christian community. the relation between the two doctrines was quite the other way around: 'The doctrine of the redemption, which is mentally appropriated through faith, is only a fragment from the more comprehensive mystical redemption-doctrine, which Paul has broken off and polished to give him the particular refraction which he requires. Schweitzer contrasts Paul's "realistic" dying and rising with Christ to the "symbolism" of Hellenism. Although Paul is widely influenced by Hellenistic thought, he is not controlled by it. Schweitzer explains that Paul focused on the idea of fellowship with the divine being through the "realistic" dying and rising with Christ rather than the "symbolic" Hellenistic act of becoming like Christ through deification. After baptism, the Christian is continually renewed throughout their lifetime due to participation in the dying and rising with Christ (most notably through the Sacraments). On the other hand, the Hellenist "lives on the store of experience which he acquired in the initiation" and is not continually affected by a shared communal experience. Another major difference between Paul's "realism" and Hellenistic "symbolism" is the exclusive nature of the former and the inclusive nature of the latter. Schweitzer unabashedly emphasizes the fact that "Paul's thought follows predestinarian lines." He explains, "only the man who is elected thereto can enter into relation with God." Although every human being is invited to become a Christian, only those who have undergone the initiation into the Christian community through baptism can share in the "realistic" dying and rising with Christ. At the age of 30, in 1905, Schweitzer answered the call of The Society of the Evangelist Missions of Paris, which was looking for a physician. However, the committee of this missionary society was not ready to accept his offer, considering his Lutheran theology to be "incorrect". He could easily have obtained a place in a German evangelical mission, but wished to follow the original call despite the doctrinal difficulties. Amid a hail of protests from his friends, family and colleagues, he resigned his post and re-entered the university as a student in a three-year course towards the degree of Doctorate in Medicine, a subject in which he had little knowledge or previous aptitude. He planned to spread the Gospel by the example of his Christian labour of healing, rather than through the verbal process of preaching, and believed that this service should be acceptable within any branch of Christian teaching. Even in his study of medicine, and through his clinical course, Schweitzer pursued the ideal of the philosopher-scientist. By extreme application and hard work, he completed his studies successfully at the end of 1911. His medical degree dissertation was another work on the historical Jesus, The Psychiatric Study of Jesus. He defended Jesus′ mental health in it. In June 1912, he married Helene Bresslau, municipal inspector for orphans and daughter of the Jewish pan-Germanist historian Harry Bresslau. In 1912, now armed with a medical degree, Schweitzer made a definite proposal to go as a physician to work at his own expense in the Paris Missionary Society's mission at Lambaréné on the Ogooué river, in what is now Gabon, in Africa (then a French colony). He refused to attend a committee to inquire into his doctrine, but met each committee member personally and was at last accepted. Through concerts and other fund-raising, he was ready to equip a small hospital. In spring 1913, he and his wife set off to establish a hospital (Albert Schweitzer Hospital) near an existing mission post. The site was nearly 200 miles (14 days by raft) upstream from the mouth of the Ogooué at Port Gentil (Cape Lopez) (and so accessible to external communications), but downstream of most tributaries, so that internal communications within Gabon converged towards Lambaréné. The catchment area of the Ogooé occupies most of Gabon. Lambaréné is marked. In the first nine months, he and his wife had about 2,000 patients to examine, some travelling many days and hundreds of kilometers to reach him. In addition to injuries, he was often treating severe sandflea and crawcraw sores, framboesia (yaws), tropical eating sores, heart disease, tropical dysentery, tropical malaria, sleeping sickness, leprosy, fevers, strangulated hernias, necrosis, abdominal tumours and chronic constipation and nicotine poisoning, while also attempting to deal with deliberate poisonings, fetishism and fear of cannibalism among the Mbahouin. Schweitzer's wife, Helene Schweitzer, was an anaesthetist for surgical operations. After briefly occupying a shed formerly used as a chicken hut, in autumn 1913 they built their first hospital of corrugated iron, with two 13-foot rooms (consulting room and operating theatre) and with a dispensary and sterilising room in spaces below the broad eaves. The waiting room and dormitory (42 by 20 feet) were built, like native huts, of unhewn logs along a 30-yard path leading from the hospital to the landing-place. The Schweitzers had their own bungalow and employed as their assistant Joseph, a French-speaking Galoa (Mpongwe) who first came as a patient. After World War I broke out in July 1914, Schweitzer and his wife, German citizens in a French colony when the countries were at war, were put under supervision by the French military at Lambaréné, where Schweitzer continued his work. In 1917, exhausted by over four years' work and by tropical anaemia, they were taken to Bordeaux and interned first in Garaison and then from March 1918 in Saint-Rémy-de-Provence. In July 1918, after being transferred to his home in Alsace, he was a free man again. At this time Schweitzer, born a German citizen, had his parents' former (pre-1871) French citizenship reinstated and became a French citizen. Then, working as medical assistant and assistant-pastor in Strasbourg, he advanced his project on the philosophy of civilization, which had occupied his mind since 1900. By 1920, his health recovering, he was giving organ recitals and doing other fund-raising work to repay borrowings and raise funds for returning to Gabon. In 1922, he delivered the Dale Memorial Lectures in Oxford University, and from these in the following year appeared Volumes I and II of his great work, The Decay and Restoration of Civilization and Civilization and Ethics. The two remaining volumes, on The World-View of Reverence for Life and a fourth on the Civilized State, were never completed. In 1924 he returned without his wife, but with an Oxford undergraduate, Noel Gillespie, as assistant. Everything was heavily decayed, and building and doctoring progressed together for months. He now had salvarsan for treating syphilitic ulcers and framboesia. Additional medical staff, nurse (Miss) Kottmann and Dr. Victor Nessmann, joined him in 1924, and Dr. Mark Lauterberg in 1925; the growing hospital was manned by native orderlies. Later Dr. Trensz replaced Nessmann, and Martha Lauterberg and Hans Muggenstorm joined them. Joseph also returned. In 1925–6, new hospital buildings were constructed, and also a ward for white patients, so that the site became like a village. The onset of famine and a dysentery epidemic created fresh problems. Much of the building work was carried out with the help of local people and patients. Drug advances for sleeping sickness included Germanin and tryparsamide. Trensz conducted experiments showing that the non-amoebic strain of dysentery was caused by a paracholera vibrion (facultative anaerobic bacteria). With the new hospital built and the medical team established, Schweitzer returned to Europe in 1927, this time leaving a functioning hospital at work. He was there again from 1929 to 1932. Gradually his opinions and concepts became acknowledged, not only in Europe, but worldwide. There was a further period of work in 1935. In January 1937, he returned again to Lambaréné and continued working there throughout World War II. Who can describe the injustice and cruelties that in the course of centuries they [the coloured peoples] have suffered at the hands of Europeans?... If a record could be compiled of all that has happened between the white and the coloured races, it would make a book containing numbers of pages which the reader would have to turn over unread because their contents would be too horrible. Our culture divides people into two classes: civilized men, a title bestowed on the persons who do the classifying; and others, who have only the human form, who may perish or go to the dogs for all the 'civilized men' care. If all this oppression and all this sin and shame are perpetrated under the eye of the German God, or the American God, or the British God, and if our states do not feel obliged first to lay aside their claim to be 'Christian'—then the name of Jesus is blasphemed and made a mockery. And the Christianity of our states is blasphemed and made a mockery before those poor people. The name of Jesus has become a curse, and our Christianity—yours and mine—has become a falsehood and a disgrace, if the crimes are not atoned for in the very place where they were instigated. For every person who committed an atrocity in Jesus' name, someone must step in to help in Jesus' name; for every person who robbed, someone must bring a replacement; for everyone who cursed, someone must bless. Schweitzer was nonetheless still sometimes accused of being paternalistic, colonialist, and racist in his attitude towards Africans, and in some ways his views did differ from that of many liberals and other critics of colonialism. For instance, he thought that Gabonese independence came too early, without adequate education or accommodation to local circumstances. Edgar Berman quotes Schweitzer as having said in 1960, "No society can go from the primeval directly to an industrial state without losing the leavening that time and an agricultural period allow." Schweitzer believed dignity and respect must be extended to blacks, while also sometimes characterizing them as children. He summarized his views on European-African relations by saying "With regard to the negroes, then, I have coined the formula: 'I am your brother, it is true, but your elder brother.'" Chinua Achebe has criticized him for this characterization, though Achebe acknowledges that Schweitzer's use of the word "brother" at all was, for a European of the early 20th century, an unusual expression of human solidarity between Europeans and Africans. Schweitzer eventually emended and complicated this notion with his later statement that "The time for speaking of older and younger brothers has passed". Later in life he became more convinced that "modern civilization" was actually inferior to or the same as previous cultures in terms of morality. American journalist John Gunther visited Lambaréné in the 1950s and reported Schweitzer's patronizing attitude towards Africans. He also noted the lack of Africans trained to be skilled workers. By comparison, his contemporary Sir Albert Cook in Uganda had been training nurses and midwives since the 1910s and had published a manual of midwifery in the local language of Luganda. After three decades in Africa, Schweitzer still depended on Europe for nurses. The journalist James Cameron visited Lambaréné in 1953 (when Schweitzer was 78) and found significant flaws in the practices and attitudes of Schweitzer and his staff. The hospital suffered from squalor and was without modern amenities, and Schweitzer had little contact with the local people. Cameron did not make public what he had seen at the time: according to a BBC dramatisation, he made the unusual journalistic decision to withhold the story, and resisted the expressed wish of his employers to publish an exposé. The poor conditions of the hospital in Lambaréné were also famously criticized by Nigerian professor and novelist Chinua Achebe in his essay on Joseph Conrad's novel Heart of Darkness: "In a comment which has often been quoted Schweitzer says: 'The African is indeed my brother but my junior brother.' And so he proceeded to build a hospital appropriate to the needs of junior brothers with standards of hygiene reminiscent of medical practice in the days before the germ theory of disease came into being." The keynote of Schweitzer's personal philosophy (which he considered to be his greatest contribution to mankind) was the idea of Reverence for Life ("Ehrfurcht vor dem Leben"). He thought that Western civilization was decaying because it had abandoned affirmation of life as its ethical foundation. In the Preface to Civilization and Ethics (1923) he argued that Western philosophy from Descartes to Kant had set out to explain the objective world expecting that humanity would be found to have a special meaning within it. But no such meaning was found, and the rational, life-affirming optimism of the Age of Enlightenment began to evaporate. A rift opened between this world-view, as material knowledge, and the life-view, understood as Will, expressed in the pessimist philosophies from Schopenhauer onward. Scientific materialism (advanced by Herbert Spencer and Charles Darwin) portrayed an objective world process devoid of ethics, entirely an expression of the will-to-live. Schweitzer wrote, "True philosophy must start from the most immediate and comprehensive fact of consciousness, and this may be formulated as follows: 'I am life which wills to live, and I exist in the midst of life which wills to live.'" In nature one form of life must always prey upon another. However, human consciousness holds an awareness of, and sympathy for, the will of other beings to live. An ethical human strives to escape from this contradiction so far as possible. For Schweitzer, mankind had to accept that objective reality is ethically neutral. It could then affirm a new Enlightenment through spiritual rationalism, by giving priority to volition or ethical will as the primary meaning of life. Mankind had to choose to create the moral structures of civilization: the world-view must derive from the life-view, not vice versa. Respect for life, overcoming coarser impulses and hollow doctrines, leads the individual to live in the service of other people and of every living creature. In contemplation of the will-to-life, respect for the life of others becomes the highest principle and the defining purpose of humanity. The laying down of the commandment to not kill and to not damage is one of the greatest events in the spiritual history of mankind. Starting from its principle, founded on world and life denial, of abstention from action, ancient Indian thought – and this is a period when in other respects ethics have not progressed very far – reaches the tremendous discovery that ethics know no bounds. So far as we know, this is for the first time clearly expressed by Jainism. After the birth of their daughter (Rhena Schweitzer Miller), Albert's wife, Helene Schweitzer was no longer able to live in Lambaréné due to her health. In 1923 the family moved to Königsfeld im Schwarzwald, Baden-Württemberg, where he was building a house for the family. This house is now maintained as a Schweitzer museum. From 1939–48 he stayed in Lambaréné, unable to go back to Europe because of the war. Three years after the end of World War II, in 1948, he returned for the first time to Europe and kept traveling back and forth (and once to the US) as long as he was able. During his return visits to his home village of Gunsbach, Schweitzer continued to make use of the family house, which after his death became an archive and museum to his life and work. His life was portrayed in the 1952 movie Il est minuit, Docteur Schweitzer, starring Pierre Fresnay as Albert Schweitzer and Jeanne Moreau as his nurse Marie. Schweitzer inspired actor Hugh O'Brian when O'Brian visited in Africa. O'Brian returned to the United States and founded the Hugh O'Brian Youth Leadership Foundation (HOBY). Schweitzer was awarded the Nobel Peace Prize of 1952, accepting the prize with the speech, "The Problem of Peace". From 1952 until his death he worked against nuclear tests and nuclear weapons with Albert Einstein, Otto Hahn and Bertrand Russell. In 1957 and 1958 he broadcast four speeches over Radio Oslo which were published in Peace or Atomic War. In 1957, Schweitzer was one of the founders of The Committee for a Sane Nuclear Policy. On 23 April 1957, Schweitzer made his "Declaration of Conscience" speech; it was broadcast to the world over Radio Oslo, pleading for the abolition of nuclear weapons. His speech ended, "The end of further experiments with atom bombs would be like the early sunrays of hope which suffering humanity is longing for." Weeks prior to his death, an American film crew was allowed to visit Schweitzer and Drs. Muntz and Friedman, both Holocaust survivors, to record his work and daily life at the hospital. The film The Legacy of Albert Schweitzer, narrated by Henry Fonda, was produced by Warner Brothers and aired once. It resides in their vault today in deteriorating condition. Although several attempts have been made to restore and re-air the film, all access has been denied. In 1955 he was made an honorary member of the Order of Merit (OM) by Queen Elizabeth II. He was also a chevalier of the Military and Hospitaller Order of Saint Lazarus of Jerusalem. Schweitzer died on 4 September 1965 at his beloved hospital in Lambaréné, now in independent Gabon. His grave, on the banks of the Ogooué River, is marked by a cross he made himself. His cousin Anne-Marie Schweitzer Sartre was the mother of Jean-Paul Sartre. Her father, Charles Schweitzer, was the older brother of Albert Schweitzer's father, Louis Théophile. Schweitzer was a vegetarian. [better source needed]However, in an account written by Dr. Edgar Berman, it is suggested that Schweitzer consumed fried liver at a Sunday dinner in Lambaréné. The Albert Schweitzer Fellowship was founded in 1940 by Schweitzer to unite US supporters in filling the gap in support for his Hospital when his European supply lines were cut off by war, and continues to support the Lambaréné Hospital today. Schweitzer, however, considered his ethic of Reverence for Life, not his Hospital, his most important legacy, saying that his Lambaréné Hospital was just "my own improvisation on the theme of Reverence for Life. Everyone can have their own Lambaréné." Today ASF helps large numbers of young Americans in health-related professional fields find or create "their own Lambaréné" in the US or internationally. ASF selects and supports nearly 250 new US and Africa Schweitzer Fellows each year from over 100 of the leading US schools of medicine, nursing, public health, and every other field with some relation to health (including music, law, and divinity). The peer-supporting lifelong network of "Schweitzer Fellows for Life" numbered over 2,000 members in 2008, and is growing by nearly 1,000 every four years. Nearly 150 of these Schweitzer Fellows have served at the Hospital in Lambaréné, for three-month periods during their last year of medical school. The prize was first awarded on 29 May 2011 to Eugen Drewermann and the physician couple Rolf and Raphaela Maibach in Königsfeld im Schwarzwald, where Schweitzer's former residence now houses the Albert Schweitzer Museum. Recordings of Schweitzer playing the music of Bach are available on CD. During 1934 and 1935 he resided in Britain, delivering the Gifford Lectures at Edinburgh University, and those on Religion in Modern Civilization at Oxford and London. He had originally conducted trials for recordings for HMV on the organ of the old Queen's Hall in London. These records did not satisfy him, the instrument being too harsh. In mid-December 1935 he began to record for Columbia Records on the organ of All Hallows, Barking-by-the-Tower, London. Then at his suggestion the sessions were transferred to the church of Ste Aurélie in Strasbourg, on a mid-18th-century organ by Johann Andreas Silbermann (brother of Gottfried), an organ-builder greatly revered by Bach, which had been restored by the Lorraine organ-builder Frédéric Härpfer shortly before the First World War. These recordings were made in the course of a fortnight in October 1936. Schweitzer developed a technique for recording the performances of Bach's music. Known as "The Schweitzer Technique", it is a slight improvement on what is commonly known as mid-side. The mid-side sees a figure-8 microphone pointed off-axis, perpendicular to the sound source. Then a single cardioid microphone is placed on axis, bisecting the figure-8 pattern. The signal from the figure-8 is mult-ed, panned hard left and right, one of the signals being flipped out of polarity. In the Schweitzer method, the figure-8 is replaced by two small diaphragm condenser microphones pointed directly away from each other. The information that each capsule collects is unique, unlike the identical out-of-polarity information generated from the figure-8 in a regular mid-side. The on-axis microphone is often a large diaphragm condenser. The technique has since been used to record many modern instruments. Ste Aurélie: Prelude and Fugue in C minor; Prelude and Fugue in E minor; Toccata and Fugue in D minor. Chorale Preludes: Schmücke dich, O liebe Seele (Peters Vol 7, 49 (Leipzig 4)); O Mensch, bewein dein Sünde groß (Vol 5, 45); O Lamm Gottes, unschuldig (Vol 7, 48 (Leipzig 6)); Christus, der uns selig macht (Vol 5, 8); Da Jesus an dem Kreuze stand (Vol 5, 9); An Wasserflüssen Babylon (Vol 6, 12b); Christum wir wollen loben schon (Vol 5, 6); Liebster Jesu, wir sind hier (Vol 5, app 5); Mit Fried und Freud ich fahr dahin (Vol 5, 4); Sei gegrüßet, Jesu gütig (Var 11, Vol 5, app. 3); Jesus Christus, unser Heiland (Vol 6, 31 (Leipzig 15)); Christ lag in Todesbanden (Vol 5, 5); Erschienen ist der herrlich Tag (Vol 5, 15). Later recordings were made at Parish church, Günsbach: These recordings were made by C. Robert Fine during the time Dr. Schweitzer was being filmed in Günsbach for the documentary "Albert Schweitzer." Fine originally self-released the recordings but later licensed the masters to Columbia. Chorale-Preludes: O Mensch, bewein dein Sünde groß (1st and 2nd versions, Peters Vol 5, 45); Wenn wir in höchsten Nöten sein (Vor deinen Thron tret ich hiermit) (vol 7, 58 (Leipzig 18)); Ich ruf zu dir, Herr Jesu Christ (Vol 5, 30); Gelobet seist du, Jesu Christ (Vol 5, 17); Herzlich tut mich verlangen (Vol 5, 27); Nun komm, der Heiden Heiland (vol 7, 45 (BWV 659a)). The above were released in the United States as Columbia Masterworks boxed set SL-175. — (2001) [German, 1906. English edition, A. & C. Black, London 1910, 1911], The Quest of the Historical Jesus; A Critical Study of Its Progress From Reimarus To Wrede, translated by Montgomery, William, Augsburg Fortress Publishers, ISBN 978-0-8006-3288-5 . — (1905), J. S. Bach, Le Musicien-Poète [JS Bach, the Poet Musician] (in French), introduction by C. M. Widor, Leipzig: Breitkopf & Härtel with P. Costellot . Fulltext scan. — (1908), J. S. Bach (in German) (enlarged ed. ), Leipzig: Breitkopf & Härtel . English translation by Ernest Newman, with author's alterations and additions, London 1911. Fulltext scans (English): Vol. 1, Vol. 2. — (1906). Deutsche und französische Orgelbaukunst und Orgelkunst [German and French organbuilding and organ art] (in German). Leipzig: Breitkopf & Härtel. (first printed in Musik, vols 13 and 14 (5th year)). — (1948) . The Psychiatric Study of Jesus: Exposition and Criticism. Gloucester, Massachusetts: Peter Smith Publisher. ISBN 978-0-8446-2894-3. — (1912). Paul and His Interpreters, A Critical History. Translated by Montgomery, W. London: Adam & Charles Black. — (1985) . The Mystery of the Kingdom of God: The Secret of Jesus' Messiahship and Passion. Prometheus Books. ISBN 978-0-87975-294-1. — (1922). Zwischen Wasser und Urwald [On the Edge of the Primeval Forest]. Translated by Campion, C. T. London: A. & C. Black. — (1998) [1930, 1931], The Mysticism of Paul the Apostle, Johns Hopkins University Press, ISBN 978-0-8018-6098-0 . — (1931). Mitteilungen aus Lambaréné [More from the Primeval Forest]. Translated by Campion, C. T. London: A. & C. Black. — (1931). Aus Meinem Leben und Denken. Leipzig: Felix Meiner Verlag. translated as — (1998) . Out of My Life and Thought: An Autobiography. Johns Hopkins University Press. ISBN 978-0-8018-6097-3. — (1935). Indian Thought and Its Development. Boston, Massachusetts: Beacon Press. OCLC 8003381. Afrikanische Geschichten (Felix Meiner, Leipzig u. Hamburg 1938): tr. Mrs C. E. B. Russell as From My African Notebook (George Allen and Unwin, London 1938/Henry Holt, New York 1939). Modern edition with Foreword by L. Forrow (Syracuse University Press, 2002). — (4 November 1954). "The Problem of Peace". The Nobel Foundation. Retrieved 18 August 2017. — (1958). Peace or Atomic War?. New York: Henry Holt. ISBN 978-0-8046-1551-8. — & Neuenschwander, Ulrich (1968). The Kingdom of God and Primitive Christianity. New York: Seabury Press. OCLC 321874. — (2005). Brabazon, James (ed.). Albert Schweitzer: Essential Writings. Maryknoll, NY: Orbis Books. ISBN 978-1-57075-602-3. ^ He officiated at the wedding of Theodor Heuss (later the first President of West Germany) in 1908. ^ Schweitzer, Albert (10 December 1953), "Award Ceremony Speech", The Nobel Peace Prize 1952, The Nobel prize . ^ Oermann 2016, p. 43. ^ Free 1988, p. 74. ^ Stammbaum – Genealogic tree Arbre généalogique de la famille Schweitze, Schweitzer, archived from the original on 26 April 2006 . ^ Association Internationale Albert Schweitzer, retrieved 1 August 2012 . ^ Seaver 1951, p. 3–9. ^ Joy 1953, p. 23–24. ^ Joy 1953, p. 24. ^ a b Cicovacki, Predrag (2 February 2009). Albert Schweitzer's Ethical Vision A Sourcebook. Oxford University Press. ISBN 9780199703326. ^ Schweitzer, Albert; Bresslau, Helene; Stewart, Nancy (2003). Albert Schweitzer-helene Bresslau: the Years Prior to Lambarene. Syracuse University Press. ISBN 9780815629948. ^ Brabazon, James (2000). Albert Schweitzer: A Biography. Syracuse University Press. ISBN 9780815606758. 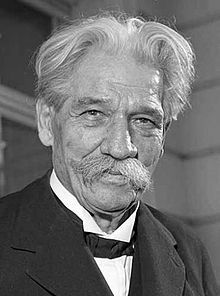 ^ a b "Albert Schweitzer - Biographical". www.nobelprize.org. Retrieved 10 March 2018. ^ Joy 1953, p. 24–25. ^ a b Seaver 1951, p. 20. ^ Joy 1953, p. 58–62. ^ Cassirer, Ernst (1979). Verene, Donald Phillip (ed.). Symbol, Myth, and Culture: Essays and Lectures of Ernst Cassirer 1935-1945. New Haven, Conn.: Yale University Press. p. 230. ISBN 978-0-300-02666-5. ^ Joy 1953, pp. 53–57, quoting from and translating A. Schweitzer, 'Mes Souvenirs sur Cosima Wagner', in L'Alsace Française, XXXV no. 7 (12 February 1933), p. 124ff. ^ Joy 1953, pp. 165–166: Text of 1909 Questionnaire and Report, pp. 235–269. ^ Seaver 1951, p. 44. ^ Given by the Paris Bach Society, Seaver 1951, p. 63; but Joy 1953, p. 177, says it was given by the Paris Missionary Society. ^ Seaver 1951, p. 63–64. ^ Joy 1953 plate facing p. 177. ^ Oermann 2016, p. 101-102. ^ Brabazon 2000, p. 422. ^ Pierhal 1956, p. 63. ^ Pierhal 1957, p. 63f. ^ a b Schweitzer 1931, p. 1. ^ Schweitzer 1931, p. 2. ^ Schweitzer 1931, p. 3. ^ a b Schweitzer 1931, p. 13. ^ Schweitzer 1931, p. xvi. ^ Schweitzer 1931, p. 16. ^ Schweitzer 1931, p. 17. ^ Schweitzer 1931, p. 103. ^ Schweitzer 1931, p. 9. ^ Seaver 1951, p. 40. ^ Marxsen, Patti M. Helene Schweitzer: A Life of Her Own. First Edition. Syracuse, New York: Syracuse University Press, 2015. ^ Monfried, Walter (10 February 1947). "Admirers Call Dr. Schweitzer "Greatest Man in the World"". Milwaukee, Wisconsin. pp. 1, 3. ^ From the Primeval Forest, Chapters 3–5. ^ Schweitzer, Albert (1931), On the Edge of the Primeval Forest, New York: Macmillan, p. 115, OCLC 2097590 . ^ Schweitzer 2005, p. 76–80. ^ Brabazon 2000, p. 253-256. ^ Berman, Edgar (1986), In Africa With Schweitzer, Far Hills, NJ: New Horizon Press, p. 139, ISBN 978-0-88282-025-5 . ^ a b Schweitzer, Albert (1924) . "Social Problems in the Forest". On the Edge of the Primeval Forest. Translated by Ch. Th. Campion. p. 130. ^ Quoted by Forrow, Lachlan (2002). "Foreword". In Russell, C.E.B. (ed.). African Notebook. Albert Schweitzer library. Syracuse University Press. p. xiii. ISBN 978-0-8156-0743-4. Retrieved 23 June 2017. ^ Paget, James Carleton (2012). "Albert Schweitzer and Africa". Journal of Religion in Africa. 24 (3): 277–316. JSTOR 41725476. ^ Cameron, James (1966) . Point of Departure. Law Book Co of Australasia. pp. 154–74. ISBN 9780853621751. ^ On Monday 7 April 2008 ("The Walrus and the Terrier" – programme outline) BBC Radio 4 broadcast an Afternoon Play "The Walrus and the Terrier" by Christopher Ralling concerning Cameron's visit. ^ Civilization and Ethics, Chapter 21, p. 253: reprinted as A. Schweitzer, The Philosophy of Civilization, (Prometheus Books, Buffalo 1987), Chapter 26. ^ "The Nobel Peace Prize 1952". The Nobel Foundation. 21 May 2014. Retrieved 18 August 2017. ^ "List of Members of the Order of Merit, past and present". British Monarchy. Retrieved 2 December 2008. ^ "Louis Théophile Schweitzer". Roglo.eu. Retrieved 18 October 2011. 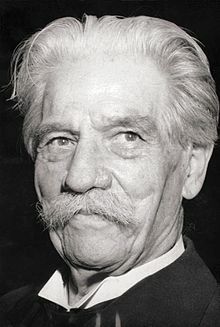 ^ "History of Vegetarianism – Dr Albert Schweitzer (1875–1965)". Ivu.org. 4 September 1965. Archived from the original on 21 May 2011. Retrieved 1 July 2011. ^ "Dr. Albert Schweitzer – Take Heart – Christian Vegetarian Association". All-creatures.org. Retrieved 1 July 2011. ^ In Africa With Schweitzer, (New York: Harper & Row Publishers, 1986), page 165. ^ "The Albert Schweitzer Fellowship". Schweitzerfellowship.org. 23 June 2011. Archived from the original on 16 July 2011. Retrieved 1 July 2011. ^ "Königsfeld feiert ?Schweitzer-Erben? | Südkurier Online". Suedkurier.de. 30 May 2011. Retrieved 1 July 2011. ^ This fine 1909 Harrison and Harrison organ was blitzed in the War (cf W. Kent, The Lost Treasures of London (Phoenix House 1947), 94–95) but was rebuilt in 1957, see "Archived copy". Archived from the original on 5 July 2008. Retrieved 6 May 2008. CS1 maint: Archived copy as title (link). ^ Seaver 1951, p. 139–152. ^ E.M.G., The Art of Record Buying (London 1960), pp. 12–13. Philips ABL 3092, issued March 1956. Schweitzer, Albert (1931), The Mysticism of Paul the Apostle, Johns Hopkins University Press . ——— (1965), The Schweitzer Album, New York: Harper & Row . Brabazon, J. (1975). Albert Schweitzer: A Biography. New York: G. P. Putnam's Sons. ISBN 978-0-399-11421-2. Brabazon, J. (2000). Albert Schweitzer: A Biography. Albert Schweitzer library. Syracuse University Press. ISBN 978-0-8156-0675-8. Retrieved 2 July 2017. Free, A.C. (1988). Animals, Nature and Albert Schweitzer. Flying Fox Press. ISBN 978-0-9617225-4-8. Retrieved 2 July 2017. Joy, Charles R., ed. (1953). Music in the Life of Albert Schweitzer. London: A. & C. Black. Oermann, N. O. (2016). Albert Schweitzer: A Biography. Oxford University Press. ISBN 978-0-19-108704-2. Retrieved 2 July 2017. Pierhal, J. (1956). Albert Schweitzer: the life of a great man. Lutterworth. Retrieved 2 July 2017. Pierhal, J. (1957). Albert Schweitzer: the story of his life. Philosophical Library. Retrieved 2 July 2017. Seaver, G. (1951). Albert Schweitzer: The Man and His Mind. London: A. & C. Black. Rud, A. G. Albert Schweitzer's Legacy for Education: Reverence for Life (Palgrave Macmillan; 2011) 173 pp. The Helfferich Collection, collected by Reginald H. Helfferich on Albert Schweitzer, is at the Andover-Harvard Theological Library at Harvard Divinity School in Cambridge, Massachusetts.